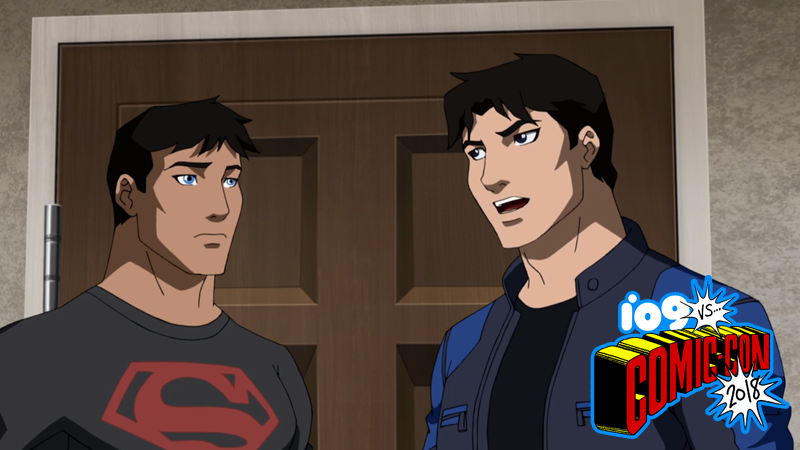 Superboy and Nightwing in Young Justice: Outsiders. Young Justice fans were happily surprised to hear Warner Bros. would be continuing the animated series from Greg Weisman and Brandon Vietti after its supposed end back in 2013. At Comic-Con today, we learned more about what to expect from the unexpected third season which is set to air on the newly revealed DC Universe streaming service. Young Justice: Outsiders picks up not too long after the tragic climax of the second season, which saw Wally West sacrificing himself in order to save the world. Though the disbanded team of young heroes are still mourning the loss of the comrade, they’re brought together by an all-too-real problem threatening the world’s growing population of metahumans. With knowledge of the metagene now public, governments across the world begin to realize the potential they have to be turned into weapons of mass destruction and soon, a metahuman trafficking ring arises that only Young Justice’s heroes are equipped to take down. Though the footage of the new season is brief, it’s packed dense with a whole host of new characters like Prince Brion of Markovia and Halo, one of the original Outsiders from DC’s comics. It’s been long overdue but yeah, Young Justice is back, folks. You’ll be able to catch up with the squad when the new season premieres on DC Universe sometime next year.